A WSAC cooling system is compact and has low power consumption thanks to its high cooling efficiency. The process medium output temperature is as low as possible thanks to the single approach to the wet bulb temperature. Unlike traditional air-cooled heat exchangers, the tube bundles in a WSAC are sprayed with water and use evaporative cooling to reject the heat from the process medium. This results in superior cooling and a WSAC is both significantly smaller, has a lower power consumption and lower output temperature than an air cooler. Since the tube bundles are sprayed directly with cooling water, a WSAC system has a single approach to the wet bulb temperature, meaning the process medium output temperature is as low as possible. A WSAC system is capable of cooling the process medium to a temperature just 2.7°C (5°F) above the surrounding wet bulb temperature. A cooling tower/heat exchanger system, on the other hand, has two approaches to the wet bulb temperature due to the intermediate cooling water loop. This means the process medium output temperature will always be higher and an extra chiller stage is required to achieve the same results as with a WSAC. The cooling water spray and air travel in the same direction (co-current draft), which creates a uniform water film on the tubes that minimizes corrosion. Thanks to the spacing between the tubes, the nozzle design and the absence of cooling tower fill, a WSAC can operate on water of low quality, e.g. blowdown water from a cooling tower, treated wastewater or sea water. A WSAC can run on significantly higher cycles of concentration (C.O.C.) than a cooling tower. A common C.O.C. for a WSAC is around 6 whereas a cooling tower can only go as high as 3 before clogging in the heat exchanger starts to become a concern. The flexibility in water sources and the high C.O.C reduces water consumption and associated costs significantly, making WSAC an ideal choice for regions where water is expensive. 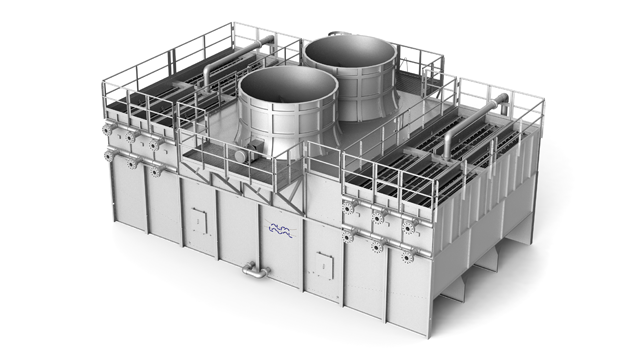 Alfa Laval HybridCool technology makes it possible to combine a traditional air cooler with a WSAC, allowing operators to choose operating mode depending on ambient temperatures in order to save water. During the cooler months of the year, the system can operate in dry mode to save water, and during the hot months wet operation can be engaged to ensure a low outlet temperature. By combining the two technologies the overall efficiency of the system is high, system size is small and both power and water consumption are kept to a minimum.